ESPN Radio for the iPhone and iPod touch s a sports radio fan's dream come true. This app from ESPN offers live streams of 20 different ESPN radio stations as well as an “on demand” SportsCenter feature which enables you to listen to the most recent SportsCenter update at the tap of a button. The list of included ESPN affiliate stations features stations in New York, Chicago, and Los Angeles as well as smaller markets like Honolulu. We are the World(wide Leader in Sports): ESPN Radio offers live streams of 20 different ESPN radio stations as well as an On Demand SportsCenter feature that delivers the latest news to your iPhone or iPod touch. The SportsCenter On Demand button is a gem. It allows you to catch up on the latest headlines without worrying about missing the SportsCenter updates on the radio. This truly puts ESPN Radio in your pocket. One of the best features is the availability of background streaming. Tapping a button opens a live stream in the iPhone's Safari browser which in turn frees you from keeping the ESPN Radio app open while listening. Now you can listen to the radio, check your e-mail and surf the Web, all at the same time and without having the ESPN app open in front of you. Sure, it's a workaround, but it will do until the iPhone 4.0 update and its promised multitasking support arrive. If your alma mater is a major Division I basketball school, the ESPN Radio app might just get even better for you. The app includes live streaming of NCAA Division I games in cities where the local ESPN affiliate broadcasts a school's games. For example, my girlfriend, a Marquette alum, was pleased when she learned she could listen to Marquette games on ESPN Milwaukee via this app. The broadcasting station is different for every school but if you know that your local ESPN affiliate airs your alma mater's games, you might be able to listen to them on your iPhone. The ESPN Radio app also includes ESPN's famous "bottom line" which includes the same headlines and scores as its television counterpart. Tapping on a headline opens the full story right on the screen. 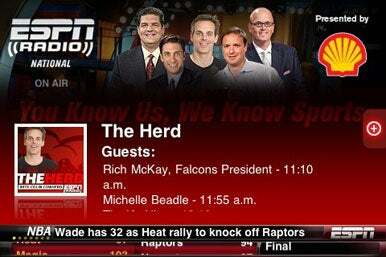 The main ESPN feed also includes a scrolling timeline of guests for each show. If you want to hear Buster Olney talk about baseball on The Herd, you know to listen beginning at 11:18 AM for the beginning of that segment. While the app includes the timeline, it also includes a one-sentence description of the current program airing on all the other stations, too. Unfortunately this description seems to be incorrect at times, especially during live broadcasts. I listened to the two-overtime thriller between Kansas State and Xavier in last month's NCAA basketball tournament via the Honolulu affiliate. Why the Honolulu station? I found the game by accident. None of the "now playing" descriptions mentioned the NCAA tournament so I went from station to station until I found the game. I experienced a similar situation while searching for ESPN's weekly NBA broadcast. This is a minor issue, however, especially given the overall polish of this app. ESPN Radio is a must-have app for die-hard ESPN Radio listeners or for sports fans who just want sports radio in their pockets. The SportsCenter On Demand feature is perfect for sports fans on the go. This is one app that really delivers.